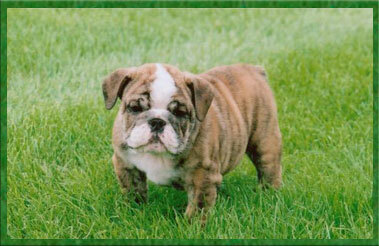 We specialize in raising healthy quality English Bulldogs. Only the top bloodlines are selected such as Legend, Cherokee, Legacy, Little Pond, and Supple. 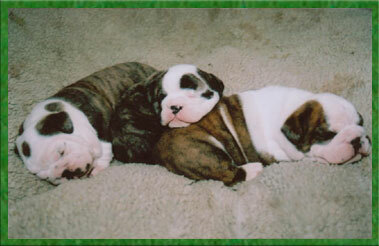 Our puppies have the looks and the temperament that you expect from a first quality Bulldog. All of the puppies are hand-raised in our home with lots of love and attention. They receive constant, around the clock care for the first few weeks of their lives making them very people-friendly. 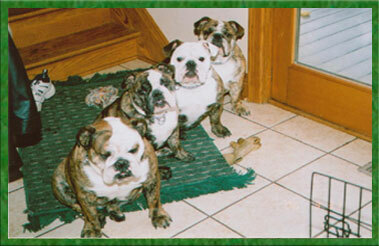 Once they've had their first set of shots, we start socializing them with other bulldogs. They receive lots of supervised playtime and, of course..... more love and attention. Puppies are ready to go at eight weeks of age. 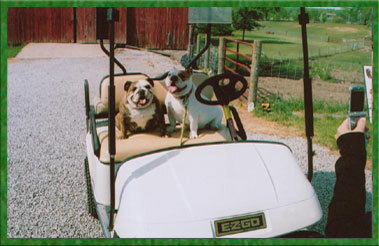 They come with AKC papers, are checked by the veterinarian and are current on vaccinations. We may have a best friend waiting for you.